Ok, after seeing those BEAUTIFUL Starbucks pumpkin scones and hearing how delightful they taste, I had to get a fall fix and whip up a batch without gluten or dairy. My mission was successful, so I'll share with those of you who LOVE pumpkin as much as we do. To start with, I had a small organic pumpkin from the local store. I cut it in half, removed the seeds, and baked it with cut sides down for 45 minutes at 350 degrees F. Once it cooled, I scooped out the pumpkin, leaving the skin behind. What I am not using for this recipe gets frozen for future recipes. To make the pumpkin easier to use, I puree it in the Vita Mix for a bit. Of course you can buy canned pumpkin, but cooking a pumpkin or squash is much more rewarding as you have plenty left over for additional dishes, and optional seeds to roast! Additionally, you have the added benefit of truly embracing fall. Now, back to the scone. I started out with a regular recipe, and I adapted it for gluten free and dairy free. The original recipe can be found here. The original recipe shows step by step photos of how to lay out and cut scones, pre baking. I recommend taking a look if you haven't made scones before. Preheat oven to 425 degrees F. In a bowl, mix dry ingredients from Pumpkin Scone section. In second bowl, mix egg, pumpkin, coconut milk. Melt earth balance and pour over dry mixture. Stir into mixture with wooden spoon. Will leave pea sized clumps in mixture. Add wet mixture and fold in with wooden spoon until mixed. There will still be some lumps in batter. Pour dough onto stoneware cooking sheet (I use a Pampered Chef stoneware cookie sheet, which works great for this type of gluten free baking). Spread into rectangle, leaving aprox 2 inches on each end of the pan. The rectangle of dough will be approximately 1 inch thick (3/4 would work). I leave my dough together and score it, but I don't separate it, as the gluten free batter is messy. Look at the original recipe, to see what this looks like. The final picture of the dough on pan with scoring, before cutting the scones, is how it should look on your stoneware pan. These will plump up a bit while baking. Bake aprox 17 minutes, or until edges begin to golden and top bounces back when touched. Mix simple glaze and top. Then mixed spiced glaze and drizzle. Enjoy! I love the idea of using coconut milk in this recipe; I imagine it makes a great complement to the flavor or the pumpkin and spices. 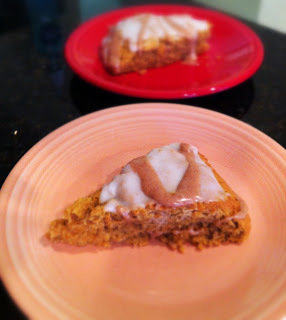 I'll include a link in my recipe - I know there are tons of people out there who would be thrilled to find a gluten free / dairy free pumpkin scone recipe! This pumpkin dairy free recipe looks so yummy. I really love to surf the web for these dairy free recipes. Good for me, I am a lactose intolerant.